Ya’ll know I’m a Redneck ~ that’s no secret. And I love all things Southern. After all, I’m a Redneck, Southern Girl. 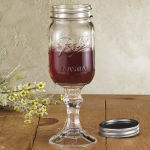 So those Redneck Wine Glasses? Yeah, I think they’re damn cute ~ or at least I did the first 857 times I saw them! I even made some of them for gifts and my friends and family pretended to like them. So when I see people at Craft Fairs, Festivals and Stores carrying these around, I think: “Glad some crafty people are making a little money”. Then I think: “Wow, the people buying them sure are a basket full of crazy if they’re spending lots of money on these!”. See, I think it’s great that people make things and sell them ~ I’ve made and sold things a few times myself so I’m all for the American Dream. What amazes me is the cost…..only $14.95 for ONE! What a deal for $14.95!!! Now, I’m all for free enterprise and everything ~ you charge WHATEVER people will pay! But all those Wanna-Be RedNeck People that are Buying these…..have they ever BEEN to WalMart and seen the cost of a dozen Pint Jars? 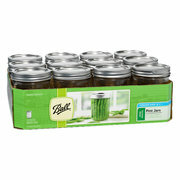 I think not…..cause you can get a dozen of these jars for $9.24!!! $9.24 for 12…..that would be 77c EACH! Then the little candle holder? Yep, $1 at the Dollar Store. So, they cost less than $2.00 to make. Now, I understand the time, energy and effort it takes to make those beautiful Red Neck Wine Glasses, but REALLY! $14.95 for ONE! So…..that Redneck that’s making and selling these to the Wanna-Be Rednecks? Pretty damn smart if you ask me! Next Will you take a quarter for that? I think it’s fine for Yankees to drink out of them…you can say they’re a gift from your southern kin folk….they are EVERYWHERE down here! I Know! That’s why I said, “I can make these!” And I’ll head on over to your spot, too! Thanks! Have a Margarita on me! Wow! How do you get the mason jar to stay on the candle holder? Ahhh… so clever you are! Those are the funniest, tackiest things I have ever seen. I can name about 14 of my closest relatives that are probably dying to have some, too! Found you on the blog hop! Glad I stopped in!